Where: White River Junction, VT | Manhattan | Philadelphia | Phoenix | Los Angeles | Minneapolis | Chicago and other towns/cities to be announced. Logline: A collection of inspiring and horrifying tales from the front lines of America’s dying higher education system presented/performed/broadcast between Memorial Day and Labor Day 2013. The rolling deadline starts February 15th and runs through Summer 2013. 2) describe (250-350wds) a single moment in your adjunct experience that stands out as epitomizing everything that’s wrong with the current higher education system. 4) discuss briefly (125-250wds) what you struggle with the most: money, CV, family, spiritual, physical, and other stresses. Word count is merely a guide. For the sake of my fatigued eyes, do your best to follow my suggested ranges/limits. 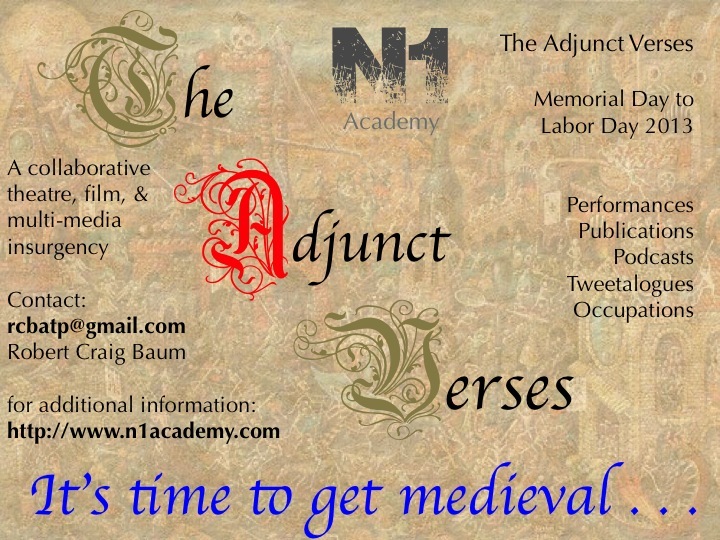 Proposals that are not selected for performance or publication will be listed on “We the Adjuncts” website. Future performances can selecte from any and all texts submitted and listed on the website. In other words, I hope you and your colleagues will create your own event using the source materials we will provide using the interviewing methods perfected by people like Anna Devere Smith, Robbie McCauley, and others. All proceeds (after costs to RCB and N1 are covered) will go to fund a digital hub called “We the Adjuncts” (e.g., financial resources, Adjunct Project inspired networking and archivization, and job/opportunity bulletin board). All published or performed monologues will list in a footnote (program or monograph) the name of the interviewee, the dates of interview, and anything the team wishes to mention about the specific conditions under which the interview was conducted and other personal shout-outs: mentors, friends, students, publishers, institutions, etc. Authors who wish to perform their words are more than welcome to contact RCB after receiving notice regarding their status in the project as live performance (to be published) or web text (to be an evolving hypertext). To my friends, family, readers, colleagues, students — it’s time to act. We can no longer just talk at conferences. We can no longer publish our stories in national newspapers that only sort-of-maybe-we-don’t-want-to-ruffle-any-feathers want to cover our stories. Like the people who came before us, people who battled under even worse conditions, we are going to have to take back our classrooms. No more permission to be granted or denied. To make this work, upon presentation and publication of the first “Adjunct Verses” (first printing/first run/first memes), it is vital that anyone and everyone hack the living daylights out of this project and start your own. Performance creates a lived relationship to ideas and struggles and histories that seem so distant, so impossible to comprehend. Tell your stories everywhere. In your classrooms. In your common areas. At your department meetings. To your Board of Trustees. It is not rude or insubordinate to speak your professional assessment of your work conditions to the people who assisted in the creation of such conditions. What is unacceptable remains the willful compliance with a system of institutional servitude that defeats the purpose of all mission and vision statements published by our colleges and universities. What is unacceptable remains the rising number of lost full time positions at colleges and universities charged with educating future skilled, professional, and academic leaders. Anyone and any institution that failes to “get that” needs to be dismantled in whatever manner seems in accordance with the outlook of an individual or group of students, teachers, and conscious administrators, senior staff, and key student representatives and funders and parents and legislators and national media figures across the political spectrum. What’s rude and unacceptable and insubordinate remains allowing a handful of executive slackers to determine out future. These keepers of the status quo care only about their job security, budgetary line items, and the corporate and governmental cronies that hardly ever listen to the teachers or students or anyone fighting on the front lines. Like their military colleagues and banker friends and Federal Government overlords, the keepers of the academic house live in fear, not love, of teaching. Why? Because we run the farm. We till the fields. We feed their children. We make or break the economic conditions under which THEY live. We are the adjuncts, the forgotten, the contingent, the sort-of-faculty, the sort-of-professional, the para-everything that seems to be the way our corporations and the representatives they bought out decades ago wishes to keep the people from taking care of themselves, bettering their living conditions, and becoming the smartest (not the most powerful military or corporate capitalist) nation on Earth. Dean of Academics Lebanon College Philosophy and Integrated Liberal Arts Writer & Producer (theatre, television, film) Composer & Producer RCB lives in the Upper Valley with his wife and four boys. Is your proposal to us a parody of the “publish or perish” myth? I like creating art, but I’ve never blogged (or tweeted or even texted), nor do I have any particular interest in it. When I compose music, I still use a pencil and paper. MI departs this form, leaving (we hope) this shell (or the memory of it) behind…consider it a migration or transmigration of form. Prepare for grand theater and cyber-happenings…Adjunct Verses, Tweetalogues, Occupations, Performances, Publications…and no telling what else or where..